DIY Doll Presents – For Any Type and Size of Doll! So your dolls have a Christmas tree, and probably a couple of presents underneath it. But maybe you’re shooting a stopmotion or photostory/shoot and you want the Christmas tree to be bursting with gifts under its beautiful branches. You want the perfect setup scene with tons of cute doll-sized wrapped goodies. Whatever the case, today I will be showing you how to make these absolutely adorable doll-sized presents! And the best part is, it’s not just for AG-sized dolls! They can be for any type and size of doll. The gift sizes are completely customizable and turn out adorable in any way! ? The phenomenal Light4theLord has the cutest, easiest tutorial on how to make a fabulous Christmas countdown calendar for your dolls! As you can see from The Countdown Chronicles, my dolls have been having waaay too much fun with it. ? The next craft was by me. I have several different ways you can make super-cute ornaments for your doll’s tree, and I love the way they turned out! Christmas Craft Collab #3 – DIY Doll Stockings… With a Twist! The next craft was also by me. Classic stockings are always awesome, but what if you want to make something extra-awesome; something different, special, and unique? Find out how to make both a classic and a stocking with a twist with my tutorial here! 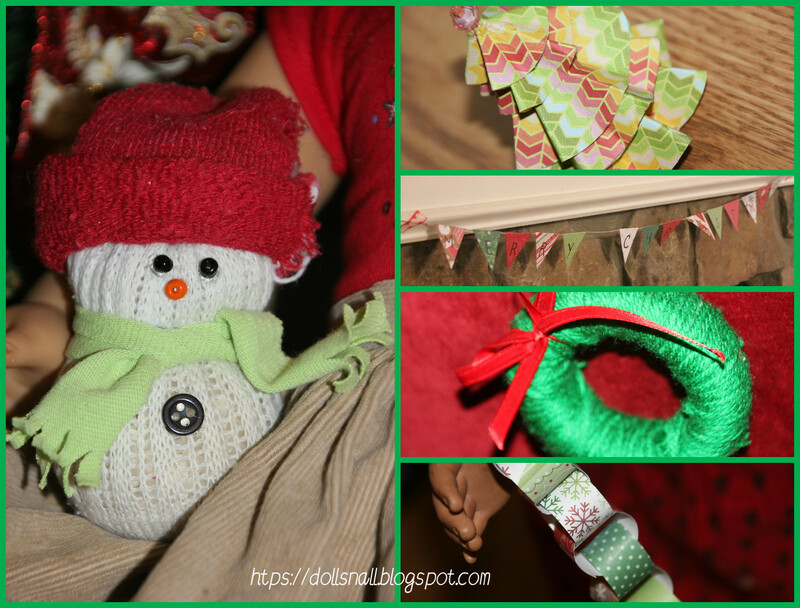 Light4theLord shared tutorials on tons of different ways to make the cutest Christmas decor for your dolls! (Look at that little snowman! Awww! ?) So far, I’ve only made the wreath since my shipment of Christmas paper I ordered was canceled (-__-), but it turned out to be Molly’s favorite Christmas decoration! This is SO cute! You could also probably modify this for 18″ dolls, too! Light4theLord shares a super simple and easy tutorial on how to make the cutest mini doll cape and muff! Pick out the flat LEGO piece you would like the size of your present to be, and begin covering the bottom with LEGO bricks. Make sure they aren’t too long and run off the plate – if they are too short, use other pieces to make up the space. Like Tetris! ? Keep stacking the LEGO pieces until you have the height you want. You should have the perfect cube by then. Now, begin covering the top with your flat pieces (the bigger pieces make this way easier). Once the top is completely covered with flat pieces, wrap it exactly like you would any ordinary present! IT’S SO CUTE! A teeny-tiny little present! ? And of course, you can make it larger or smaller, longer or shorter, depending on the type of larger doll you have or how much of a variety of gifts you’d like. If you have small dolls like American Girl mini dolls or Barbies, the tutorial below will simplify how to make this craft on a smaller scale. Get small LEGO bricks – like the 2×2 ones. For longer presents, try a 4×2 or 3×2 brick. You can stack flat stud pieces on top to make it taller and then cover it with flat pieces, or if you like the size already, go ahead and cover it with completely your flat pieces. Whatever type and size of dolls you have, this craft is easily customizable to fit them perfectly! If you try out this craft, we would absolutely LOVE to see! Please send your pictures to Mommy’s email address, madison[at]powerofGOD[dot]com. Your pictures will have a chance to be featured in the Christmas Craft Collab Recap on Christmas Eve! Madi again! 😀 Stay tuned for what’s coming up next! 😉 I had so many exciting things I wanted to pack in this December, I’m having to push ’em over to next year. This December is going to be full of Christmas surprises that I absolutely can’t wait to share! Hi! What a great craft! You have such an amazing blog and I love how you glorify God with it! I have read your blog for over a year now but have not really commented. Even my mom thinks you’re blog is great! Thanks! Aw! I love this! This should be great for photo props. Thanks so much, Madie! Thank you so much! (They should! :D) Aw, you’re welcome! Thank you for your comment! ? Adorable! Brilliant!! Now… I wonder if my brothers still have the few small legos that they have.. .or if they’ve lost them already! 😀 I’m definitely going to have to do something like this! What an awesome craft!! I was wondering how i was going to make my dolls presents, and this makes hard easy!! AMAZING craft!! If you wan’t to put a present inside, only put lego bricks around the outside on the flat piece (bottom bit) so the inside is completely empty. You then put the gift inside. Then put a flat lego brick over top and cover with the smooth top pieces. Then wrap like a normal present and ta-da, you have a present, that is not only good for photos, but for opening the presents on Christmas morning photo-shoots!!
? Hehe! Of course! LOL! ? You’re welcome! That sounds so awesome! And that is SO cool you have a dollhouse (did someone build it for you or was it purchased from somewhere?)! ? You’re welcome! Ooh, that sounds like it was awesomely fun! ? You’re welcome! I understand that completely…it can be hard to find the time for everything! :\ I hope your new “schedule” goes well, ma fren! ? ? ? It sure can! :/ Aw, thank you so much! ? LOL! ??? Speaking of which, how do you balance your blog with life and stuff? You have your act together so well – your blog is… perfection. ? But anyway, for blogging, I've had to drastically cut back on the blogs I follow/read. I have a pretty new system that helps me budget time and also helps me weed out what blogs I read. I hope that helps, Madi! Your blog is fantastic and I hope you work out your schedule! 😀 I'm heading to bed, so I probably won't respond. 😉 Zzz…??? Aw, thank you so much! Hehe, good night, Grace! Have awesome dreams. ??? Heehee, I slept very nicely, thank you! I slept until 9, which is rare for me and is probably why I feel so rested. 😛 ? To bad I don’t have any legos? Thank you so much, Sarah! Hehehe, I know, right? ? This is a great idea! They are super cute! Hello! This craft was amazing! Your blog is great! We love to see when you post! Our dolls love it too! Thank you for being such a great blogger! Thank you SO much, Tori and Bella! You just totally made my night! I am so very glad you like my blog! That means so much – thanks a billion! Okay! Perfect! You’re welcome, and thank YOU! ? Hi, Madi! Ok, first of all I just want to say, that this is the cleverest way to make doll gifts EVER! I also wanted to ask you about blogging…is this platform free? I know it’s WordPress. How did you start out? I really would like to start my own blog, but have no idea where to start!? Hey, Madi, I was wondering how you got started blogging,as I really want to start my own doll blog but don’t know much! Thanks Madi! Nice to know. My brother the computer whiz can probably help me with themes and domains! This was such a neat post, I really enjoyed it! 😀 I would try it, but I don’t have any Lego’s or time to do it, LOL! But, it’s a great idea, and your photography is so beautiful and I love all the pictures!! Your dolls are so beautiful! Thank you SO much, Livy! Haha, yeah, I know how that goes. ? LOL! Aw, thank you so much again! ? And as a matter of fact, I just got it today! Thank you so much for sending such an absolutely beautiful card – I LOVE it! I can’t wait to send you one back! ? I loved the stocking craft as well, I made one for Amelia, because she was the only doll that didn’t have one. BTW, I’m just wondering, do you use pic monkey for your thumbnails? Because every image with words on it always turns out BEAUTIFUL! So do you have any tips for adding a little “flair” to head images? Also, I absolutely LOVE to make crafts for my dolls, and I have noticed that you do too! Would you maybe consider doing a Valentines day collab with me in late January? Because you have no idea how fun that would be for me! That sounds so cool! I would LOVE to do a craft collab with you, too, but I already promised Grace (The Girl Upstairs) I would do one with her at my earliest convenience. I would absolutely love to do one with you next, though! Could I let you know whenever Grace and I schedule our craft collab, that way we could schedule ours afterwards (if you would still like to do one by then)? Great idea! Also have you seen Rouge one yet? Thank you so much! 😀 And actually, we just got home from watching Rogue One in theaters! It was AMAZING! Have you seen it yet? AHH ROGUE ONE!!! I haven’t seen it yet, but my brother has.